The UK Taiko Festival is hosted by Kagemusha Taiko on behalf of the growing taiko community in this country. The UKTF typically comprises several theatre-based concerts featuring youth groups and visiting groups and artists from Europe, USA and Japan, along with informal outdoor performances and workshops for taiko players. 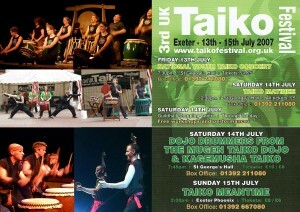 To encourage the growth of taiko in the UK. 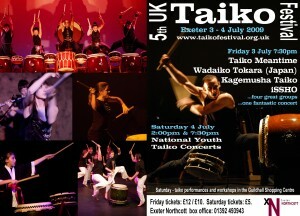 To provide a performance platform for UK-based taiko groups of all ages. To provide inspiration for new players by the participation of professional and international taiko artists. To be a showcase event for emerging young UK talent. To encourage excellence in a culture of celebration, not competition. 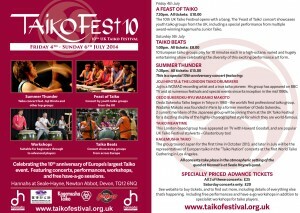 When is the U.K. Taiko Festival? 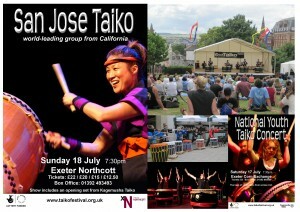 The U.K. Taiko Festival usually takes place over the first weekend in July. It ran annually for 11 years, from 2005 till 2015, when the decision was made for it to become a biennial event. 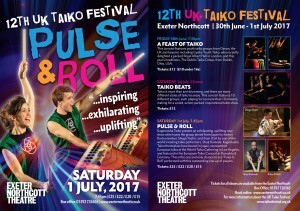 12th UK Taiko Festival took place in July 2017. 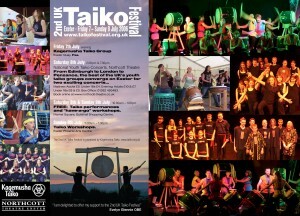 13th UK Taiko Festival will take place from 5th – 7th July 2019. 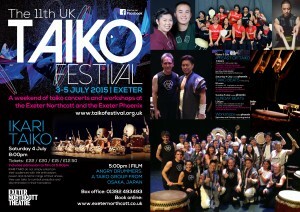 Where does the U.K. Taiko Festival take place? Exeter has usually been the host city. 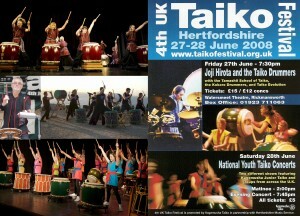 4th U.K. Taiko Festival was hosted in Hertfordshire. 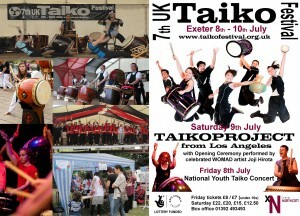 In principle, the event could be hosted in any U.K. city where there were appropriate facilities, and where it would be helpful to promote taiko. This is why the 2019 UK Taiko Festival will be held in Leicester. Click here for more details about the 2019 UK Taiko Festival. This year’s UK Taiko Festival will feature an exciting range of concerts, workshops, presentations and informal outdoor performances. Friday night’s Feast of Taiko featured 11 youth groups with some 150 young performers. On Saturday lunchtime, Taiko Beats featured 11 adult groups from the UK and Germany. In the evening, Kagemusha Taiko were joined by Shogo Yoshii and Shoji Kameda, in a show that culminated in a live performance of Brother Drum, with a collection of Western European and Japanese instruments brought together onstage for the first time ever. There were 11 workshops across the Saturday and Sunday, with 7 different workshop leaders and more than 160 participants. On Sunday evening, Tsuchigumo Daiko, joined with Kagemusha Taiko and the Brother Drum musicians, Shogo, Shoji, and also Damian Clarke, George Whitfield and Hibiki Ichikawa for a concert that mixed taiko with folk and traditional music from Western Europe and Japan. 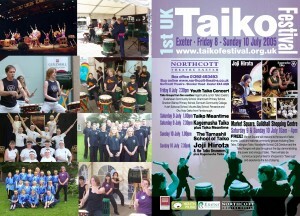 For details of previous U.K. Taiko Festivals, click on the appropriate link below.